Now that the long winter is nearly finished and with spring quickly approaching, this is the time to prep your boat for the open waters. While the temps outside might not yet be feeling anything like spring and summers on the lake, you won’t want to miss out on a single day of boating on the Lake Minnetonka waters once the temps do warm up. While you have just a few more weeks before Minnesota boating season is in full force, it’s the ideal time to get ahead of the game and complete your Checklist for Spring Boat Prep. While boating DIYers can certainly attempt this task, the pros at Anchor Marine Repair stand ready to perform your Spring Boat Maintenance work for you. Did you know that the amount and the difficulty of your Spring preparation work is dependent upon how extensively you winterized your boat systems and boat engine? Basically, the more thoroughly you have winterized your boat, the easier your prep work should be this spring. The standard boat winterization checklist includes such items as changing the oil and engine and fuel filters, servicing the battery, lubing steering systems and shifting cables, and shrink wrapping or covering the boat vents. Hopefully, you’ve performed a proper winterization and are ready to move on to prepping your boat for the Minnesota spring and summer boating season. But if you’ve discovered that your winterization skills are leaving you a bit overwhelmed with your spring prep work, don’t fret, the experts at Anchor Marine Repair can take over to perform our thorough spring inspection and analysis so that you’re back on the water in no time. Here’s a general checklist for dewinterizing your boat. Because each system varies, you’ll want to check with your owner’s manual for specific requirements. Batteries – Dewinterizing a boat begins by checking the batteries to be sure they are all charged and that the cables are clean. Keep in mind that the Coast Guard require batteries be properly secured and that battery posts remain covered. Electrical – Check that the electrical systems of your boat are in working order by testing all the switches. Water Systems – Any antifreeze should be flushed out before connecting the water lines. Next, use a commercial product to disinfect the water systems. Open each faucet and shower head (if applicable) one at a time until the water flowing out is clean. Engine – Check the levels of the oil, coolant, power steering fluid, and transmission/lower unit or outdrive oil. Inspect for signs of fluid leaks. It’s recommended that seawater pumps be serviced every other season, and the hardware should be greased each year. Controls – Check the control cables, and be sure the shifter is in “neutral”. Check the safety/kill switch and all switches. If your boat has an electric fuel pump, you will need to prime the fuel system before turning the key. Once you’ve done all the required prep work, you’ll be ready to start the engine. You should expect to see smoke from the exhaust which is normal and works to coat the spark plugs. Be sure the oil pressure is adequate, and that water is running from the exhaust. Check that all the gauges on the dash are operating properly, and inspect under the engine for fluid leaks or unusual noises that might indicate loose belts. Keep in mind that this is a general guide, and that your boat will most likely require maintenance that is specific to your boat. While performing the spring checklist is certainly doable for the DIYer, we highly recommend that boaters rely on the experts at Anchor Marine Repair for a proper and thorough spring boat maintenance analysis. 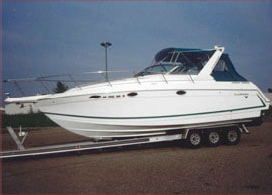 Give us a call today at (763) 972-3540 to get your boat back on the water in time for spring!